This spring salad was featured in Bliss Women Magazine. Their mission is to make women's health and well-being a priority. Check out their website to learn more! The birds are chirping, the flowers are blooming, and the sunshine lasts longer. I always look forward to the weather becoming warmer and our frozen world coming back to life. The spring is a gentle reminder that seasons do not last forever and that eventually, flowers will begin to bloom again. How can this reawakening of a flower relate to our story as women? Are you currently stuck in a career that does not allow for growth? Do you want to get your health back on track but don’t know where to start? Just like a flower emerging from its winter slumber, so can we as women come into a new season of life. It might take some hard work and sacrifice, but with time you will begin to see the fruition of your efforts and fulfillment of your goals. What better way to incorporate these ingredients than to make a spring salad! Salads are a super-convenient way to get in a couple of servings of vegetables and/or fruit into your diet. Salads can also be fun, colorful and full of great texture. For this healthy recipe, I have created a vegetarian style salad with most of these spring ingredients that contain healthy fats, protein and complex carbohydrates that will keep you satisfied. 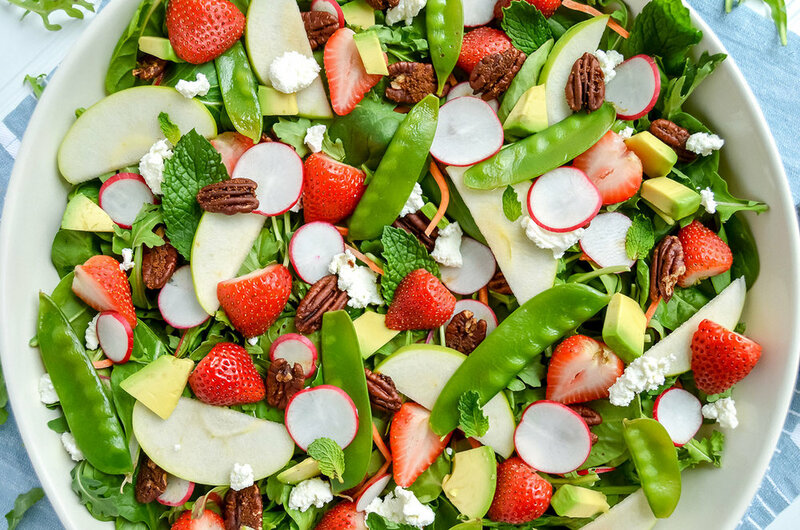 This winning strawberry fields salad is complex in flavor, yet super simple to make. 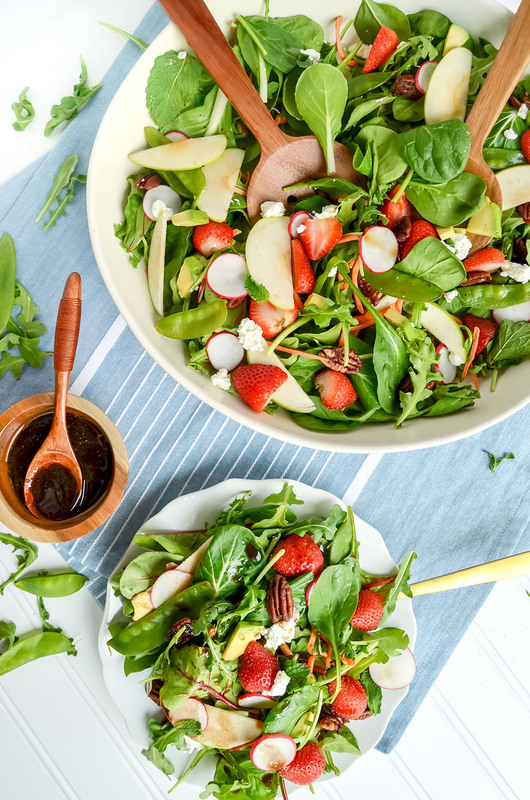 It provides just the right amount of sweetness from the strawberries and honey balsamic vinaigrette, nuttiness from the pecans, creaminess from the avocado and goat cheese, tartness from the green apples, and spiciness from the arugula and radishes. 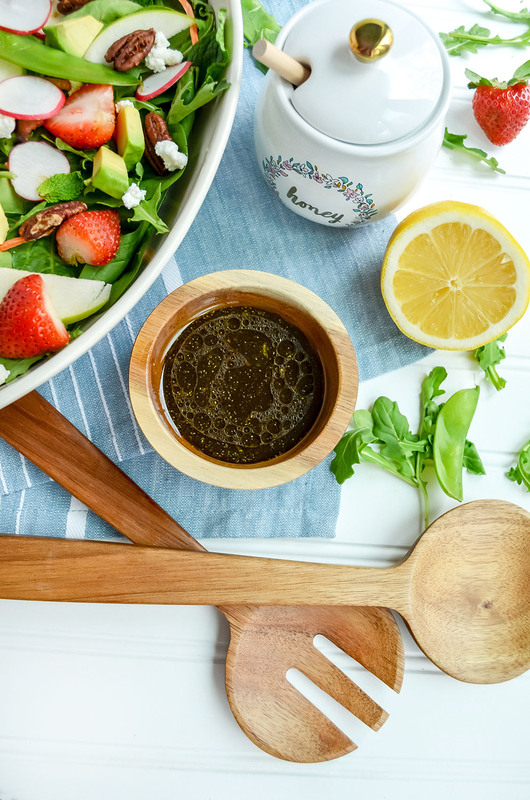 The honey balsamic vinaigrette pairs beautifully with the contrasting flavors and textures of the salad. This strawberry fields salad will become your new go-to salad for the spring! Made with fresh spring produce and a bright honey balsamic vinaigrette. A vegetarian and gluten-free option! Mix coconut oil and sugar together and add pecans. Toss until thoroughly coated. Place pecans in a single layer on a baking sheet with parchment paper. Cook for 5-10 minutes on one side and then flip them and cook for an additional 5-10 minutes. While the pecans are roasting, whisk together the vinaigrette ingredients until corporated. Give it a test taste. If you like it sweeter, add a touch more honey. If you like more vinegar, add a touch more balsamic. Toss dressing with the salad and top with avocado and coconut sugar roasted pecans.